The Squarcialupi Codex is the largest and unquestionably the most beautiful produced manuscript anthology of Italian music compiled in Florence during the first two decades of the Quattrocento. 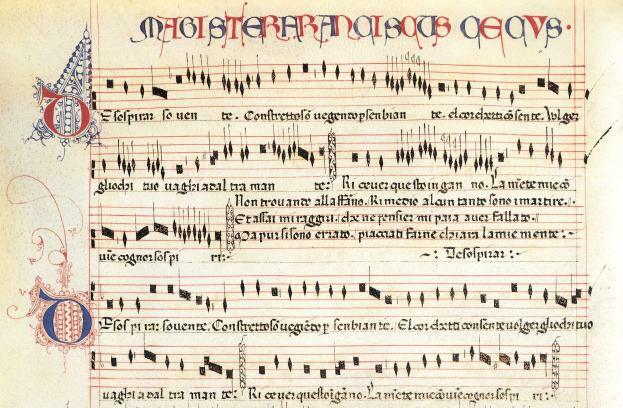 The manuscript contains over three hundred songs—madrigals, ballatas, and caccias—of which almost half are unique to this source; the repertory represents many of the well-known Trecento song composers, from the earliest generation writing towards the middle of the fourteenth century to composers still active in the first decades of the Quattrocento. Fourteen individual author sections, each headed by a portrait of the composer represented, proceed in roughly chronological order: Giovanni da Cascia, Jacapo da Bologna, Gherardello da Firenze, Vincenzo da Rimini, Lorenzo Masini, Paolo Tenorista, Donato da Firenze, Niccolò da Perugia, Bartolino da Padova, Francesco Landini, Egidio and Guglielmo da Francia, Zacara da Teramo, Andrea dei Servi and Giovanni Mazuoli. Recent art historical research helps secure the origin of the minatures and lavish decorative work in the Florentine scriptorium of Santa Maria degli Angeli in the years ca.1410-1415. Significantly, the collection offers unprecedented coverage of the compositions of mid-century Florentine repertory–works by Gherardello, Lorenzo, Donato, Vincenzo, and Niccolò, as well as Francesco Landini's younger contemporaries, Bartolino da Padova and Andrea dei Servi. Even more impressive is the high number of otherwise unknown works here attributed to Francesco Landini himself. Quite clearly, the Squarcialupi Codex documents a most ambitious undertaking on the part of early fifteenth-century Florentine compilers to assemble the native high-art music repertory of the Trecento; it is in a real sense a late medieval edition of music, poetry and illumination that combines meticulous planning, comprehensive editorial considerations, and exquisite care and beauty in displaying its contents. The Codex at one time was in the library of the noted Florentine organist Antonio Squarcialupi (1417-1480), as is attested by the inscription on the opening leaf: “Questo libro è di M° antonio di bartolomeo schuarcialupi, horganisto in sancta maria del fiores" (This book is from Antonio di Bartolomeo Squarialupi, organist at Santa Maria del Fiore). The Edition: Deluxe 8-color reproduction (+ gold) in the original format, 28.5 x 41 cm, 442 pages. Commentary (287 pp) edited by F. Alberto Gallo, with contributions by John Nádas, Kurt von Fischer, Luciano Bellosi, Margherita Ferro Luraghi, Nino Pirrotta, Giuseppe Tavani, Giulio Cattin, & Agostino Ziino. Limited edition of 998 numbered copies. Deluxe clamshell case in tooled leather, cloth and laid paper. Published 1992. Eu 2,400.